During my travels in Taiwan I visited the Amba Hotel group and had the pleasure to stay at some of the properties around Taipei city. One of these properties has been the Amba Taipei Ximending, a hotel that left me speechless. Today´s article will give you an insight in the hotel, that is more than a comfortable shelter during one´s travel. If you are looking for a home far away from home I can tell you there is nothing comparable to the Amba hotels in Taiwan. The Amba Taipei Ximending is a four-star hotel that will give one the impression of a home stay. I have never seen a hotel that is so personalized, so creative and so into details. It is a fact that the Amba hotel group is unique and totally outstanding from everything I have seen yet. It is not a luxury stay but a up class stay and I can tell that I felt home when I arrived in the hotel, while celebrating my 100th day on travel when I arrived. I think one of the facts that makes the hotel itself so unique is the close connection to the staff, which is inspiring the hotel and the whole look of it. Per example the staff decided to include Lego elements into the design of the hotel and created a creative way to express the boards of the exchange rates or the re-design the name tags. Another fact is that the hotel, which opened 2012, has a distinct way to share information and details. The check in counter is designed by bottles that have been recycled to create an installation of 2012 bottles which represent the opening of the hotel. Another eye catcher of the hotel lobby are four pictures, which look like as they were built out of mosaics but were made from stickers. All these creative ideas refer to the main thought of the hotel to recycle and to use local products. While I´ve already been deeply impressed by the lobby area, I couldn´t hold my breath when entering the room. The room is pimped with illustrations and local products. The clean and modern design gives guests the feeling of staying in a perfectly designed home, that provided everything one will need. A huge bed area and an area, supplied with a couch and vintage furniture expresses the comfort and creativity of the hotel. I felt so inspired and happy to stay at the Amba hotel that I´ve been sad to leave. The surrounding and the atmosphere of the hotel were different from what I´m used to and really caught my attention. My fascination for the hotel continued even out of the room, to be more detailed when I went to the lobby leveled restaurant for dinner. As the hotel is in an area of Taipei which is full of cinemas you might also guess that the decoration of the food and drinks is special but would you guess it to be original movie equipment? Probably not, but that’s just what it has been. The food was beside the fancy decoration also extremely tasty and there has been even a load of vegetarian options and even vegan options were available on the menu. For a starter, I absolutely recommend the apple quinoa salad. 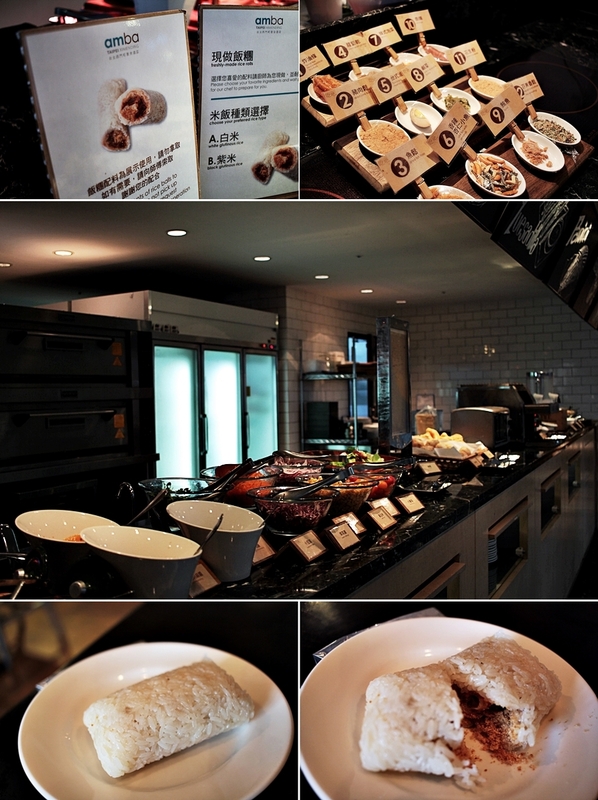 The special dish of the hotel is the pizza and indeed, it was truly delicious. I usually don’t go for pizza but I´ve been so curious to thy the dough, that I ordered a pizza (without cheese). For Lactose Vegetarians, there is also a lactose free cheese option of the menu. Beside the food also the restaurant location is quiet charming. The resultant is in the same level as the lobby and is all furniture with books and games, which guests are also allowed to take up to the room. It refers to the home atmosphere, that I was also praising in my previous lines but honestly, everything has a wow-effect in these 4 walls. The hotel also has a huge seating area and worked most with natural lightening to be more environmental friendly and to save energy. Beside that (almost) all products are made in Taiwan. The amba hotels try to support the local industry and to provide the charms of Taiwan within the hotel. Per example one will be able to buy local produced soaps in the lobby as well. 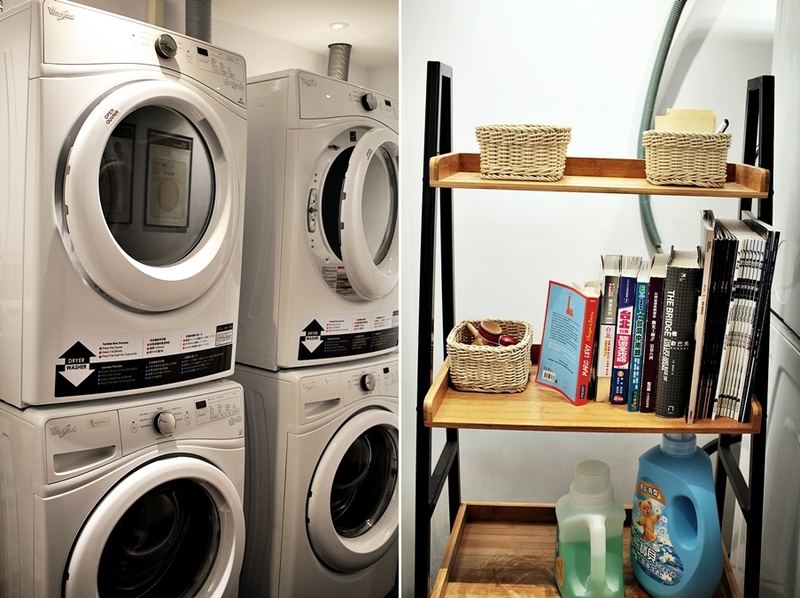 For long-term travelers, it is a praise to have access to a washing machine, without leaving the hotel. Something special about the Amba hotel chain is also that all hotels offer new washing machines, which are available to use 24 hours without any charge. Also, the washing powder is offered for free and a collection of books and toys is also placed in the washing room, that also offers dryers. My last shootout goes out for the breakfast. The hotel offers hot and cold dishes, so as fresh fruits. One of the highlights has been the vegan Dim Sum on the last day of my stay. However, a special dish that I´ve only discovered at the Amba hotels is the rice roll, which is a Taiwanese kind of food. One will have the choice of different ingredients stuff the roll with. Each roll is prepared on request and super fresh. I had a sweet option with a fried breadstick, sugar and peanut powder – worth a try. Finally, I can tell, I have never stayed at a hotel that is comparable with the Amba hotels. Ximending is a young and trendy area of Taipei, which is generally and amazing city. It was an unbelievable experience and even though I have been invited to stay at the Amba hotels these words are completely my own. I can recommend travelling Taiwan, it is one of the most modern Asian countries that I have seen yet.